Kidsboro is a small town in the woods behind Whit?s End in Odyssey. It?s a nice little place. It has a church, a store, a police station, a bakery, a weekly newspaper . . . and a total of zero citizens over the age of 14. It?s a town run by kids. Ryan Cummings, the mayor, helps enforce the laws, create new job opportunities, and in general, keep the peace in a town where he seems to have lots of friends and only a few enemies. The Kidsboro series teaches not only moral and biblical principles, but also concepts of government, politics, economic principles, the judicial system, United States history, and Bible stories. The Fight for Kidsboro is a compilation of the 4 books from this popular series. 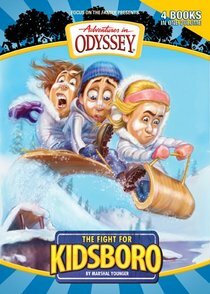 About "The Fight For Kidsboro (#05 in Adventures In Odyssey Kidsboro Series)"